​Visionary of the Soul de Cuba Cafe restaurant and founding member of the Cubanakoa Foundation, Jesus Puerto believes Cubanakoa’s mission to be one which serves to celebrate human kind’s shared history, stories and journey. Through support of Soul de Cuba Cafe companies, Jesus and members of the Cubanakoa Foundation have worked to improve relations between the United States and Cuba by way of working to establish a Sister City relationship between Honolulu and Havana, by conducting people-to-people exchanges and by leading exploration of linguistic connections between ancestral peoples of the Caribbean and the Pacific. 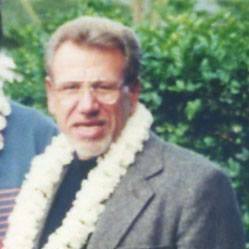 Led the development of Habitat for Humanity in Samoa. Served as Country Desk Officer for Peace Corps programs in the Caribbean and Central America. In 2004, led the development of a culturally appropriate and conscious economic venture, Soul de Cuba Cafe in New Haven, Connecticut. Two years later opened Soul de Cuba Cafe in Honolulu, Hawaii and launched Soul de Cuba Specialty Foods. Soul de Cuba Specialty Foods is the first ever nationally-distributed Cuban food product line. Founder ASI Hawaii and Kahumana Farm. Rev. Philip Ferreira Harmon, born and raised in Hawaii, was ordained in 1974 as a Russian Orthodox Priest in Lviv, Ukraine, and returned to Hawaii with the mission to care for the poor, the disenfranchised, the disabled and the homeless on the Leeward Coast of Oahu. He and Dr. Frances Sydow founded Alternative Structures International dba Kahumana Community in Waianae of 1978 in order to accomplish that mission. 40 years later ASI dba Kahumana provides cares and housing for 124 homeless families in our Transitional Housing Program, provides a daycare program for 18 adults with developmental disabilities and offers a variety of other services to the community,especially organic produce from our 14.6 acre farm and Organic Meals to the public from our Organic Cafe. Father Harmon joined Jesus Puerto and Cubanakoa Foundation in May of 2012. After he discovered both DNA evidence and actual family connections in Cuba. He is committed to linking the Island Communities of the Pacific to the Island Communities of the Caribbean. ​Self-identified as “a glocal”, born & raised on the coastal plains of Ewa Beach on the island of Oahu and the slopes of Mauna Kea in Hilo on Hawai’i Island. Multiethnic heritage and global citizen having had the privilege of traveling the world before being able to walk yet rooted in island traditions, affiliated with being a “Pan Am baby”, both parents having had careers for Pan American Airlines, the world’s largest airline industry in the history of aviation. Undergraduate degree in psychology with focus study on developmental and sociological research specializing in environmental, cultural and economic factors of human evolution. Post-graduate studies in travel industry management focused on global travel development and sustainable practices within the hotel, maritime & aviation sectors from the University of Hawai’i at Manoa. Post Graduate Certificate from the East West Center’s Asia Pacific Leadership Program (APLP) a Global Leadership Program modeled after the philosophy and teachings of what essentially initiated Hokule’a and the Pacific Voyaging Society. Focus on international relations and networking, global travel and the sustainability industry. Over 15 years of experience domestically and abroad as a professional in the hospitality & travel industry for multinational cruise lines, private aviation companies and hotel chains within operations, sales, marketing and events. Founder of Conscious Concepts, Conscious Concepts a project management, travel and event production regenerative enterprise inspired to fill the demand for services contributing to the vitality of the creative industry and the arts, the world of travel, the local culinary and food/farm movement, green/clean energy technologies and progressive models of education, holistic wellness and entrepreneurship. Currently a graduate student of Ecoversity – Regenerative Enterprise Masters Program, C.E.B.A.. Grounded in creating functional economic and community prosperity through culture, environment, business and the arts. In 2012, on the island of Oahu, Hawaii, Lala earned certification in Permaculture Systems Management.